Mr and Mrs Boot live here with their two children, Poppy and Sam. They have a dog called Rusty, and a cat called Whiskers. Ted drives the tractor, and helps look after all the animals on the farm. A colourful sticker book to help preschool children learn their first words and read simple sentences with Poppy, Sam and the animals of Apple Tree Farm. Each double page shows a large, busy scene on the farm, with a border of clearly labelled pictures of animals, fruit and vegetables and toys for children to match the stickers to. With over 100 stickers to match to the correct words and phrases. 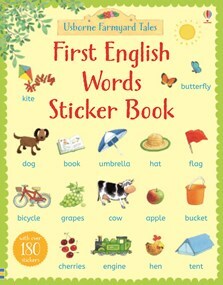 Children can listen to the words read by a native English speaker at the Usborne Quicklinks Website. Bought this book for my 4 yr old who is currently in the nursery class at school. Kept her really absorbed matching the stickers to the words. Really good educational book, but fun as well, I would highly recommend this book to parents of other children this age. Looking to buy some more now! I sat my 5 year old daughter at the kitchen table with this book, and she was totally engrossed! Apart from wanting to cover everything in stickers at the moment, she is also just reading and writing. She was totally absorbed in the challenge of finding the colour coded stickers, having a go at spelling the words out loud and of course decorating the pages with all the stickers! Meanwhile I was able to get on with preparing the dinner. Highly recommended for keeping somebody busy!